The Tower of London and Cutty Sark were London to me when I was growing up. They were the only two places that I had visited in the capital until I was well into double figures. Years later, the news that Cutty Sark was ablaze and might not survive reduced me to tears. Phoenix-like she has arisen from the ashes and is once again open to the public. The Junior CW’s have an extensive collection of model sailing ships and so a visit to the last remaining tea clipper was a necessity. 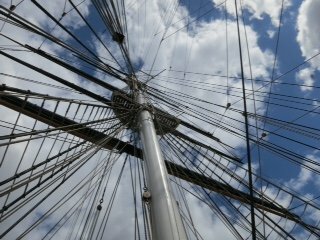 We started our visit on the main deck with eleven miles of rigging spun above our heads. Cutty Sark was built in 1869 to ply the tea route between the UK and China. Unfortunately the same year saw the Suez Canal open, giving steam ships the edge on the route East. So wool replaced tea as the Cutty Sark’s cargo and Australia became the destination. For 10 years she held the record for the fastest journey to the Antipodes. One down from the main deck is the ‘tween deck with the living accommodation for the 26 crew, ranging from the luxurious Master’s suite down to the bunks for the lowlier crew members. Thrillingly’ young boys can try the bunks for size. Down in the hold the story of the Cutty Sark’s various cargos is told. The most memorable part of our trip for the Junior CW’s was a navigation game involving a big ship’s wheel testing your skill to try and steer a course to Australia. Even now I remember the figureheads most from my visit in the 70’s and the world’s largest collection can still be seen. lives on board. In the 70’s they lived below deck; now they live in the light-filled space below the hull. During restoration, the hull was re-clad in copper, which was used to protect the hull from sea water: but instead of smearing it with tar, the metal has been left so that you can enjoy the lovely colour as you walk under the Cutty Sark admiring her fine lines from below the water mark. Greenwich has many excellent cafes but there is no need to head away from the Cutty Sark. Beneath the hull is the fine Even Keel café serving not only tea but also a tempting array of cakes. The shop offers several model versions of the ship and we were naturally unable to leave without one to add to our domestic fleet. Greenwich is a UNESCO World Heritage Site and is perfect to explore with or without children we have enjoyed wandering round the Old Royal Naval College and visiting the Queen’s House. Travelling to and from Greenwich is almost as exciting as the Cutty Sark herself, you can arrive in style on a Thames Clipper and depart on the Docklands Light Railway (ensure you get a seat at the front to get the full “driving the train” experience). Tickets do sell out and so it is advisable to book ahead, a variety of combination tickets are available for the many attractions that Greenwich has to offer. Wow, how beautiful the ship looks now – all that copper must look incredible. Now I’m longing to go – I hope they let middle-aged women try out the bunks! They didn’t stop this middle-aged woman! I adore the Cutty Sark. The restoration is beautiful and there are so many interesting things for little kids and their parents to explore. I love the figureheads. I just don’t understand why we don’t adorn our vehicles and buildings anymore. Beautiful view of the hull! Must visit during my next visit to London. Visiting again from #CulturedKids. My two loved that navigation game as well – I was useless at it! 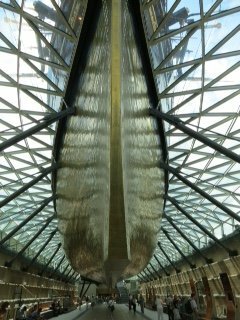 There’s a real beauty in the Cutty Sark and I really enjoyed travelling to Greenwich by boat. I read about this museum / attraction before and immediately bookmarked it as an intriguing cultural experience for kids (and their grown-up helpers). In fact, there are so many things that I want to do in London now after reading your and others’ blogs… Will have to plan a trip soon! Thanks for the inspiration. What a fantastic nick name!